I always opt for easy recipes on Thanksgiving. For me, Thanksgiving is not the time to bust out time-consuming fancy pie lattice (although this is coming from a not-so-great baker), so something that has the effect of a pie but with half the work is a winning recipe in my opinion! That’s where the crostata comes in. 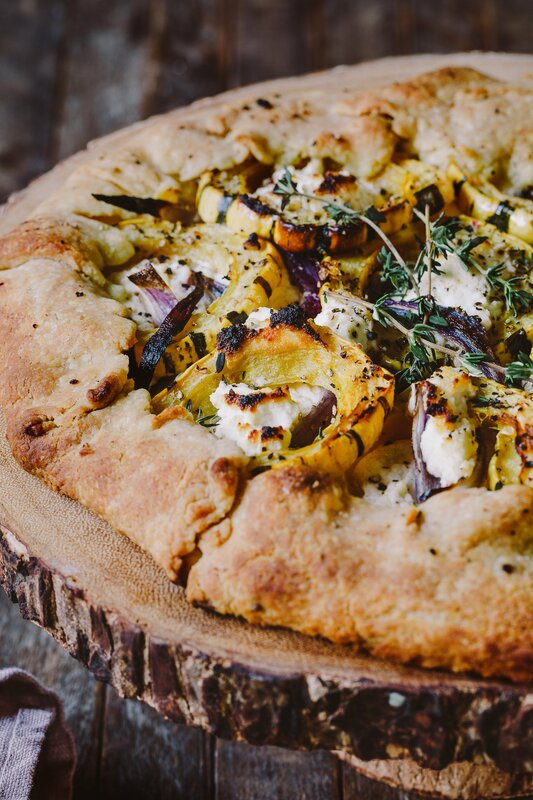 This time instead of doing a sweet crostata filled with fruit, I’ve made it savory, filled with roasted delicata squash, onions, and ricotta. I love the rustic look of this crostata and its combination of fall colors — it’ll be the perfect centerpiece on your Thanksgiving table! 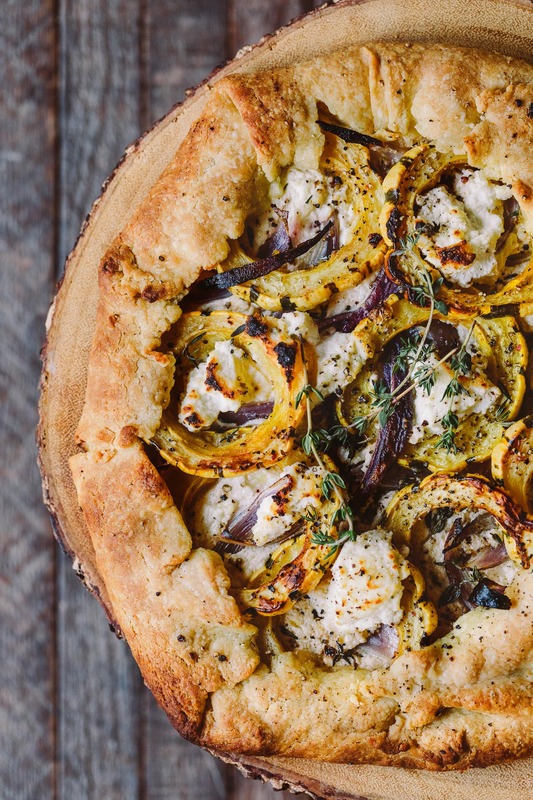 This savory crostata is filled with roasted delicata squash, onions, and ricotta. A lovely combination of fall colors, and perfect centerpiece on your Thanksgiving table! Pulse the flour, salt and butter in a food processor until the butter becomes the size of peas. Drizzle 1/4 cup cold water until the dough just comes together. Wrap in plastic wrap and refrigerate for at least 30 minutes. Preheat the oven to 425 degrees. Slice the delicata squash into about 1/4 inch thick rings and scoop out the seeds. Thinly slice the red onions. Roll the dough out into a circle (roughly, doesn't have to be perfect) and transfer onto a parchment lined baking sheet. Brush a thin layer of extra virgin olive oil over the top and spread the ricotta over. Sprinkle a couple pinches of salt and pepper over the ricotta. 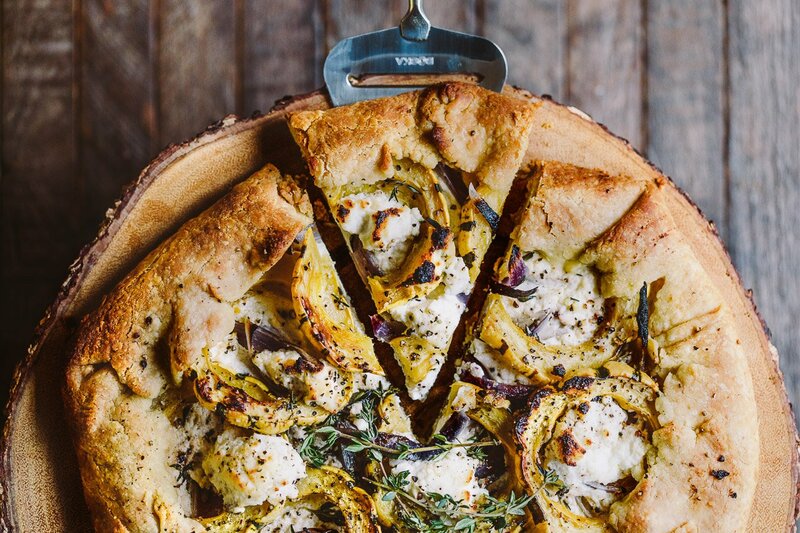 Layer the red onions and then squash over the crostata. Brush more olive oil over the veggies to coat. Sprinkle with a little more salt and pepper and leaves from a couple sprigs of thyme. Fold the edges of the crostata over about an inch and brush the edges with olive oil. Bake for about 30-40 minutes until the pastry is golden brown and the veggies are roasted. I’m reaching out on behalf of The Rustik Oven — a new, artisan bread available exclusively in California and Nevada. This new brand just launched in September, and we’re looking to partner with social media tastemakers to extend the digital reach of this launch through the holiday season. We love your aesthetic and thought you’d be the perfect fit for this partnership! 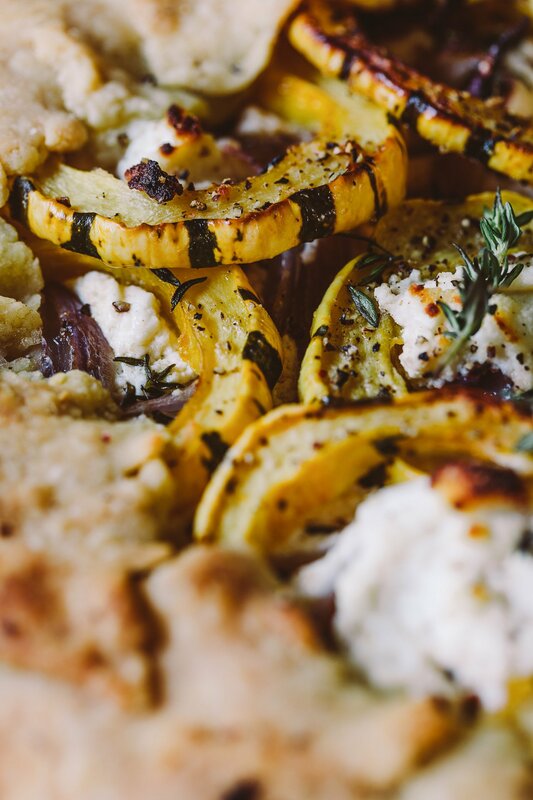 A non-GMO product made with simple, real ingredients and without any artificial colors, flavors or preservatives, The Rustik Oven uses a traditional European baking process to develop rich flavor before it’s baked in stone ovens to deliver a crunchy, golden crust. Available in three varieties — Artisan White, Sourdough and Hearty Grains & Seeds — The Rustik Oven brings together the great artisan taste and texture of hand-crafted bread with the convenience and long-lasting freshness of traditional sliced bread. We’d like you to develop a blog post featuring a custom recipe using The Rustik Oven bread with holiday entertaining in mind where the bread is the star – like a toast, crostini or bruschetta. We’d then like the blog post to be amplified on your social media channels including Instagram, Facebook and Pinterest. Let me know if you’re interested in working with Rustik and what your rate would be for this type of partnership. I’m happy to answer any questions or provide additional details if needed.